PlayFusion is going to be revealing some of the new cards from the Onslaught expansion for Age Of Sigmar: Champions this week. Watch out for Friday where we'll be revealing one of them but for now, check out the cards that have already popped up online. The first few popped up a few days ago and give us a hint as to just how each of the decks are going to be playing out. Lady Olynder is an interesting new addition to the Death Grand Alliance, who is very much focused on the removable aspect of the game. 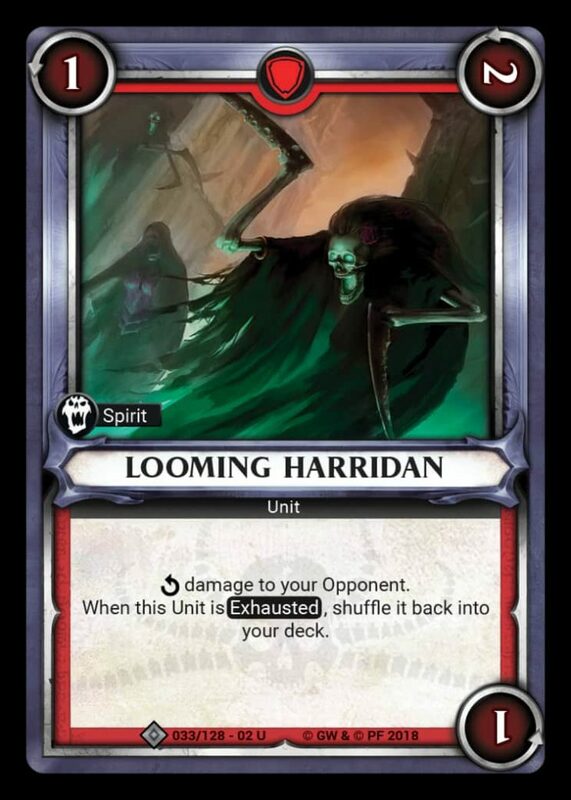 The Looming Harridan was also a good new addition to Death giving you an almost constant and reliable cycle of Spirits to drop into the mix. Your enemy will have to decide between just letting them tick through and vanish back into your deck or discard them to stop them coming back. Banish the evil! 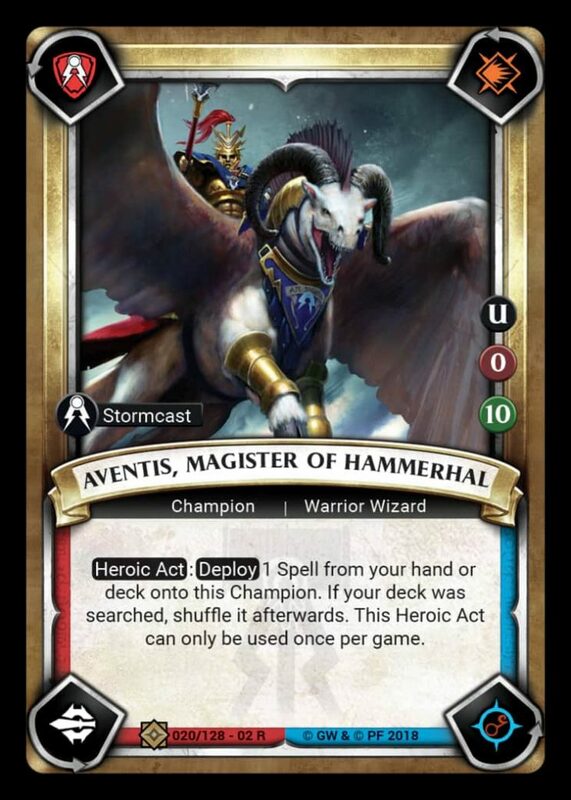 For Order, we have Aventis, Magister Of Hammerhall who very much plays on the idea of using more spells within your Stormcast faction. I'm excited by the new spell symbol which is attached to the third corner there and how that comes into play. It looks a lot like one of the Realm/Magical School symbols from Age Of Sigmar so it might tie in somehow there. 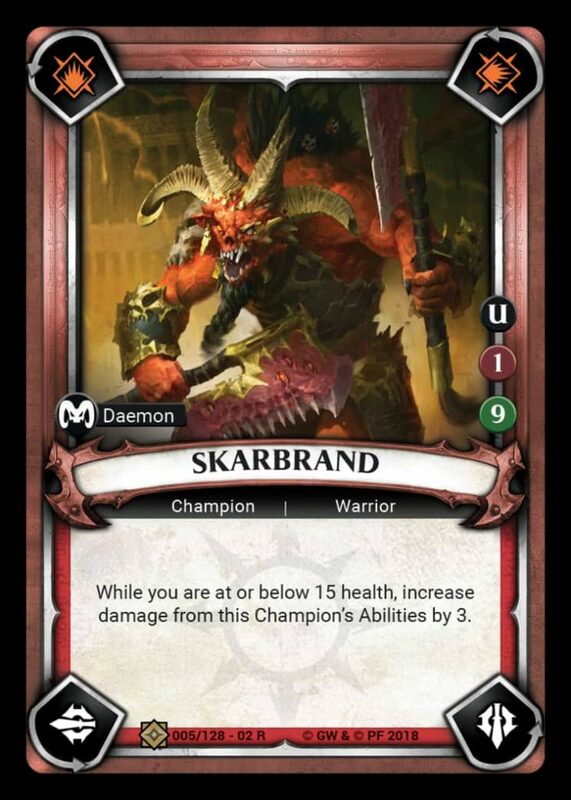 We also have a look at Skarbrand for Chaos who hammers home the need to just keep doing damage. Damage, damage, more damage, and a little bit more damage. I can't wait to use Skarbrand in a deck which is focused on just going straight for the throat and ignoring your health counter! You could easily use him as a Blessing rush character too, unlocking one very quickly OR keeping him on a chain until late game THEN unleashing him when you're health is lower. It's a risk! 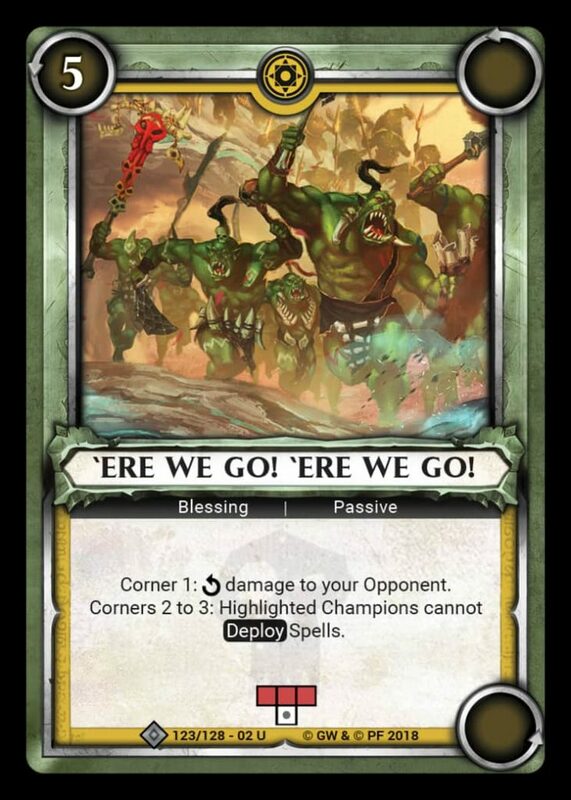 Destruction are also on the warpath with some new cards like Ere We Go, Ere We Go, Ere We Go! 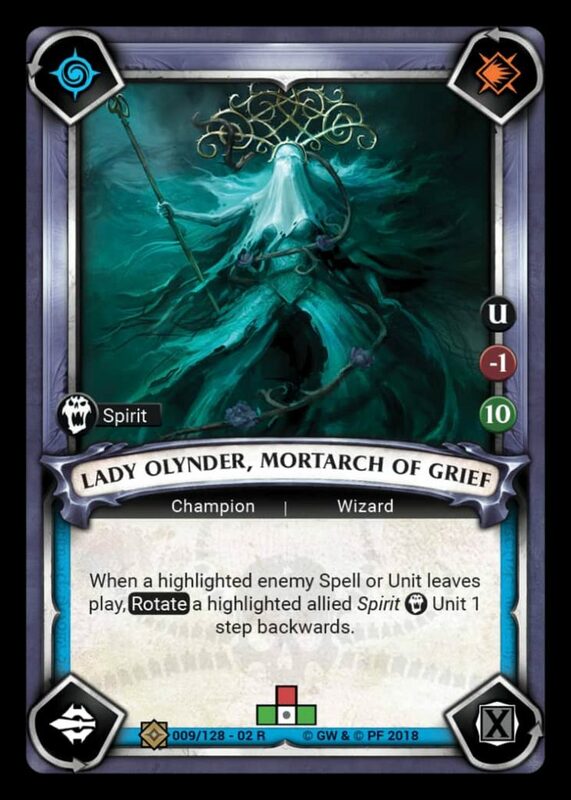 This is one of those Blessings which has been designed to work against the new focus on spells that we're no doubt going to see from Death and Order in this new expansion. The damage is welcome of course, but it is a Blessing which will only be really useful if you know your opponent is going magic heavy. You could have this as part of your sideboard in a tournament setting and break it out if you see something interesting popping up in your opponent's deck. 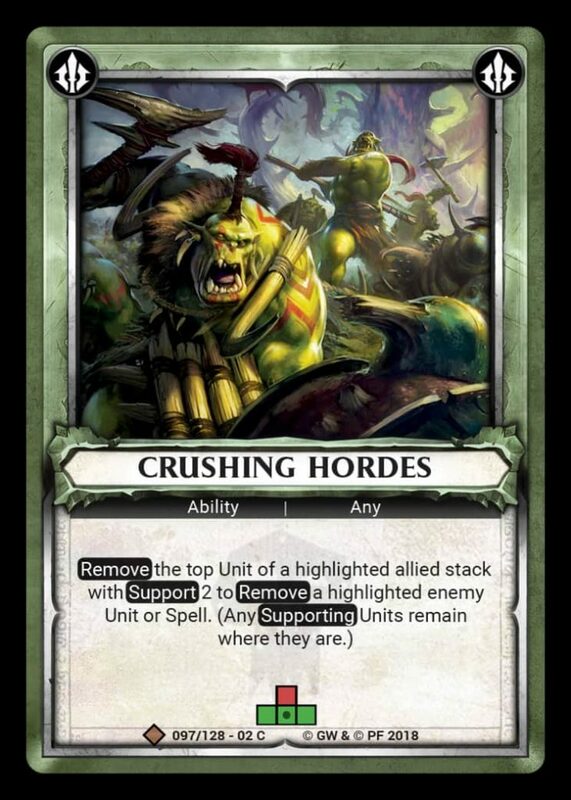 Crushing Horde is another interesting way to play with the Stacking mechanics in the game. If you work this right you can rotate your Stacks of Greenskins and then when they are about to vanish from the board you could use this ability to remove an enemy unit THEN with your second action deploy another character on top of it and restart it up again. As if Destruction needed more ways to play around with their Stacks! 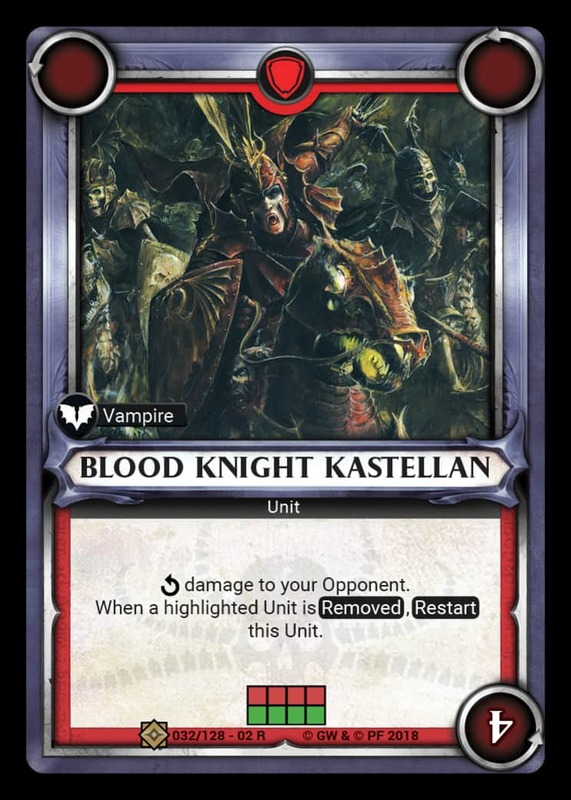 Last of the latest card reveals we also have the Blood Knight Kastellan. You can keep this unit ticking over quite a lot if you do things just right. You want to keep him on the cusp of doing damage constantly if you can, and with the real focus on removable coming up for Death it seems this should be easily done! Watch out for more card reveals from PlayFusion, us and others in the coming days! Are you going to be picking up the new expansion? 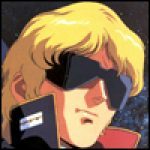 "Watch out for more card reveals from PlayFusion, us and others in the coming days!" The artwork on the cards looks fabulous. Definitely a lot more removal for each alliance coming in this wave which is going to change things up a lot.